I’ve not finished it yet, so this isn’t a review, but I’ve certainly had a good run at it so far. I’ve done about half of the 26 missions in the single player campaign, and all I can say so far is that they are brilliant fun. They’ve sort of combined the RPG elements of decision making in the storyline (side with this guy or side with that guy etc.) 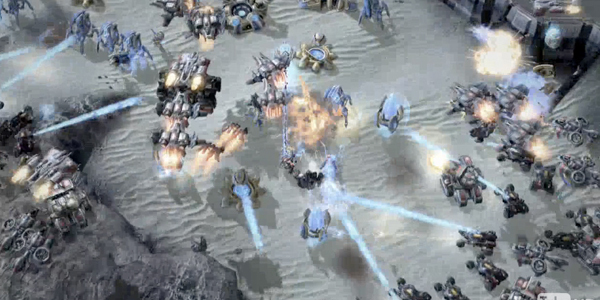 as well as a persistent upgrade and research system, which, depending on how many credits and research points you’ve collected up, allows you to make permanent upgrades to your unit types and structures, lasting you throughout the game, and yet the gameplay has all the typical Command & Conquer style strategy elements to it. Resource gathering, unit and base building, tech tree units to unlock, and a whole lot of death and destruction. Who doesn’t like that?? 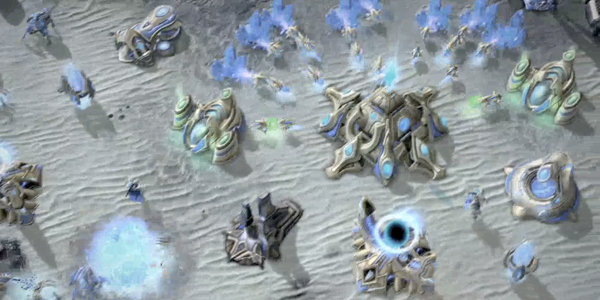 A bunch of people have complained about the fact there is only a Terran (human) campaign story to play in the game, but so far there has also been a portion of it where you get to play as the Protoss (ancient alien dudes) too, and I’m almost definitely seeing the possibility of being able to play as the Zerg (ugly alien bugs) as well toward the end of it, so there’s definitely some variety in there and it’s all good fun so far. 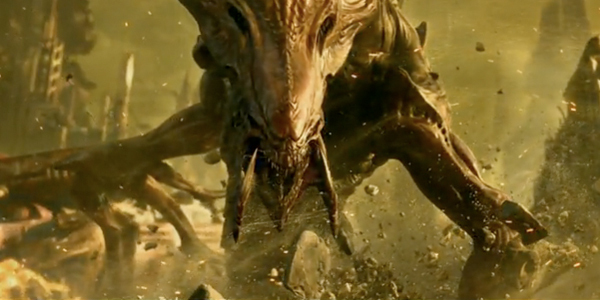 The battles in Starcraft 2 are often nothing short of epic! As for variety in gameplay, there are some really different missions to play throughout, and all of which include a whole load of achievements to gain by playing through and completing a bunch of specific tasks on certain difficulty levels, which is more than enough reason to go back and play again and again, not to mention all the different research and upgrades for your units so you can play in different ways each time, depending on your preferred strategy and if you want to mix it up a little. I’ve only got a crappy PC at the moment, so unfortunately I’m having to play Starcraft 2 on the lowest possible settings to make sure it runs at decent speed, but even so, I’m still enjoying the game a whole lot. I’m due a major upgrade by the end of this month however, which means by the time I’ve completed this game and got my a new PC, I’ll be able to go back and play the whole thing again on brutal mode with high-end graphics. Sad? Maybe. Fun? Hell yes! It should be incredibly frustrating/infuriating, but I’m sure it will be good fun all over again, too. The multiplayer in comparison to the single player is such a different experience, too. Not just because you get to play it with other people (duh), but because the pace of the game online is damn well nearly insane. So far I’ve mostly only played a bunch of 2v2 team games with a mate against some difficult A.I. opponents – which has been a total blast up to now – but I’ve also played a few games against some human opponents online, too. The amount of units and structures you get online is quite short of what’s available in the campaign, but it seems they’ve kept an incredibly well-balanced and fair selection of weapons and buildings for each of the three playable sides. If you don’t quite know how to defeat certain things when you’re staring down the barrels of their guns though, you will suffer massive losses at the hands of those who know every trick in the book. Just as a note of interest, if you weren’t already aware, Starcraft is widely considered to be South Korea’s national sport! So you’d better hope you never come across a Korean player online, or you may find yourself completely annihilated within minutes! Make sure you have enough room around your base. It's going to get cluttered in there! As I said, this isn’t really a review, it’s more of an overview of my experience with the game so far. But despite having not even finished it yet, I can say with utmost certainty that if you like strategy games, whether it’s for the long, in-depth, and varied campaign missions, or just for the intense online play that will either get your heart racing when you win or your fists punching PC monitors when you lose, this is one superb strategy game. Sadly though, I haven’t a clue if it’s possible to get a trial account without receiving a trial key from someone who has already bought the game. If you can get your hands on this, it’s definitely worth a try. 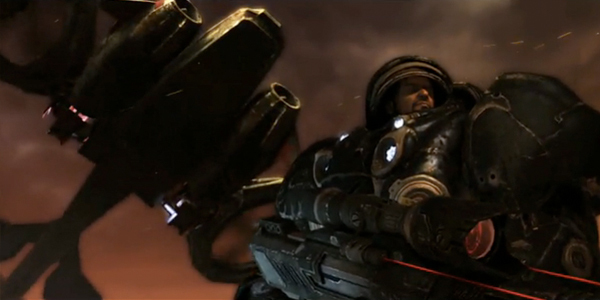 This entry was posted in Thoughts and tagged first impressions, starcraft 2, strategy. Bookmark the permalink.